Once you hit age 65, your risk heavily increases for certain health complications. One of them you might not think about, however, is falling. There is really no way to plan for a fall; it just happens under forces that are out of your control. You could be walking out your front door, answering the telephone, or stepping out of the shower when it happens. When you were younger and had more strength, you could get up from these falls. You may have had a bruise, been sore, or even experienced a break, but there’s a good chance you avoided sustaining major injury. When you’re older, however, this is not the case. 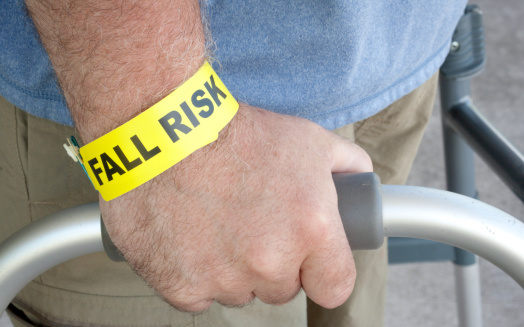 A slight fall could cause a devastating injury with major complications. Millions of American adults over age 65 experience a fall every year. Believe it or not, this is the leading cause of fatal and non-fatal injuries amongst this demographic. One of the main causes of falls—and the resulting injury—is balance. Balance is heavily impacted by muscle strength. Although strength might not be able to prevent falls all the time, it can definitely limit the severity of injuries. Secondary to muscle mass and strength for limiting injury is bone strength. The stronger your body is, the better it can absorb falls, knocks, and bumps. If you want to strengthen your muscles to improve balance and your ability to reduce the risk of a severe injury from a fall, exercise and diet are important. A recent study of 70- to 80-year-old women showed that an exercise routine consisting of balance exercises, weight-bearing exercises, strength building, and agility work made participants substantially less likely to be hurt after a fall. Muscle protects your bones and provides insulation from impact, giving you the strength to stay balanced. The more muscle mass you have, the better you can protect yourself from a break. In order to build muscle mass, eating a protein-rich diet is essential, as proteins provide the building blocks for muscle growth and maintenance. Weight shifts: Stand with your feet hip-width apart and shift your weight to your right side while you lift your left foot off the floor. Hold the position for as long as you can (or up to 30 seconds), then switch sides. Stand on one leg: stand with feet hip-width apart with your weight equally distributed on both legs and put your hands on your hips. Lift a leg off the floor and bend it back at the knee and hold for up to 30 seconds. Weighted exercises: Take a dumbbell (or other object you can grip) and perform a bicep curl with one arm while standing on your opposite foot. You can also do the curl while standing on the same foot as the side of your curl. Once you’ve mastered that, try improving balance even further by standing on a pillow while you perform the exercise. Vitamin D plays an important role in your overall health, especially bone strength. It’s required to absorb calcium, and as you’re probably aware, calcium is what builds bone mass and strength. Without vitamin D, calcium can’t do its job. The stronger and denser your bones are, the less likely they are to break on impact. The best source of vitamin D is the sun, but you can also get it through nutritional sources like eggs (the yolk), saltwater fish, liver, and fortified milk. Supplementation is also an option, but it’s typically reserved for people with vitamin D deficiencies. However, if you reside in North America and live through long, dark winters, there is a very good chance you’re not getting enough vitamin D.
A brand new study conducted by Finnish researchers and published in JAMA Internal Medicine tracked 409 women between the ages of 70 and 80 who were living at home. The exercises were conducted for two years and focused on the techniques mentioned earlier. Although neither supplementing with vitamin D or exercise were noted to reduce the number of falls, they heavily influenced the result of those falls. Those who took vitamin D supplements only were 16% less likely to be injured. Those who took a placebo and exercised were 54% less likely to get hurt from a fall. Those on the vitamin D supplement with exercise were 62% less likely to have an injury as a result of a fall. These numbers explicitly indicate the importance of vitamin D and exercise—especially exercise—to keep you safe from heavy injuries from falling. They might not be able to entirely prevent a fall, but they can definitely limit the damage and keep you upright and healthy for longer. “Calcium and Vitamin D: Important at every age,” National Institutes of Health, January 2012; http://www.niams.nih.gov/health_info/bone/bone_health/nutrition/, last accessed April 2, 2015. “Balance Exercises,” Mayo Clinic, 2015; http://www.mayoclinic.org/healthy-lifestyle/fitness/multimedia/balance-exercises/sls-20076853?s=1, last accessed April 2, 2015. Uusi-Rasi, K., et al, “Exercise and Vitamin D in Fall Prevention Among Older Women,” March 23, 2015; http://archinte.jamanetwork.com/article.aspx?articleid=2204033, last accessed April 2, 2015. “Falls Among Older Adults,” CDC web site, March 19, 2015; http://www.cdc.gov/homeandrecreationalsafety/falls/adultfalls.html, last accessed April 2, 2015.